VBS is coming July 16-20! 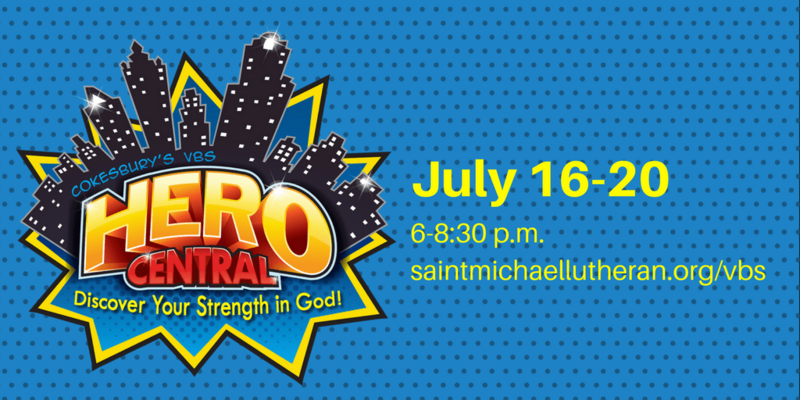 Join us July 16-20 from 6-8:30 p.m. at Saint Michael Lutheran Church for Hero Central! Saint Michael’s little angels will embark upon awesome adventures with some amazing Bible heroes and discover the qualities that make them truly heroic in God. Children will learn new musical songs, engage in science activities, create heroic crafts, save the world in recreation, and hear fantastic Bible stories to discover their many strengths in God! Of course, you can! Please contact Jodi Colgan or Andrea Stahl ASAP to learn how you can become a Hero Leader! Print your registration form here!